Any person who owns real property or an interest in real property in New York which he or she has the power to convey may do so effectively by a conveyance in writing. A person with the power to convey may also name himself and another person as grantees, and the conveyance will have the same effect as to whether it creates an estate in severalty, a joint tenancy, a tenancy by the entirety, or a tenancy in common, as if it were a conveyance from a stranger (RPP 240-b). In the state of New York, a conveyance encompasses every instrument in writing, except a will, by which any estate or interest in real property is created, transferred, assigned, or surrendered (RPP 240). The New York statutory forms offered in section 258 of the Real Property chapter are sufficient in their use as a conveyance, but it should be noted that section 258 does not invalidate or prevent the use of other forms. The basic types of deed in New York used for a conveyance of real property are the warranty deed, general warranty deed, quitclaim deed, and fiduciary deed. In New York, the capacity to hold real property and to take the same by descent, devise, or purchase is given to a citizen of the United States. Any person in this state other than a minor, a mentally retarded person, or person of unsound mind, seized of or entitled to an estate or interest in real property may transfer such estate or interest by an instrument in writing (RPP 11). Additionally, aliens are empowered to take, hold, transmit, and dispose of real property within the state in the same manner as native born citizens, and their heirs and devises may take in the same manner as citizens (RPP 10). Further, those who are entitled to acquire or convey property may also convey or mortgage land that is held adversely: No conveyance will be void for the reason that at the time of delivery of the conveyance such real property is in the actual possession of a person claiming under a title that is adverse to that of the grantor (RPP 260). The way in which the grantor holds title to real property, as well as his intentions with the transfer, will determine his method of conveyance. 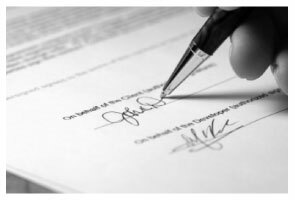 The grantor's signature is required on a real estate deed in New York. The acknowledgment of a conveyance can only be made by the person who executed it, and such proof can only be made by a witness to the execution of the instrument, who at the same time subscribed his name to the conveyance as a witness (RPP 292). In New York, an acknowledgment must not be taken by any officer unless he knows or has satisfactory evidence that the person making the acknowledgment is the person described in and who executed the instrument (RPP 303). If an instrument is proved by a subscribing witness, the witness must state his own place of residence, and that he knew the person described in and who executed the conveyance. The proof must not be taken unless the officer is personally acquainted with the witness or has satisfactory evidence that he is the same person who is a subscribing witness to the conveyance (RPP 304). A person taking the acknowledgment or proof of a conveyance must endorse upon the instrument or attach a signed certificate (RPP 306). Real estate deeds must be formatted according to statutory and local laws in order to be recorded. A conveyance of real property within the state of New York that has been duly acknowledged by the person executing it or has been proved as required may be recorded in the office of the county clerk in the county where the property is located. Every conveyance that is not recorded is void as against any subsequent purchaser or one who acquires the same real property or portion of it in good faith and for a valuable consideration, from the same vendor or assignor, and whose conveyance is first duly recorded, and is void as against the lien upon the same real property or portion of it arising from payments made upon the execution of or pursuant to the terms of a contract with the same vendor, if such contract is made in good faith and is first duly recorded (RPP 291). This is known as a race-notice recording act and is designed to protect subsequent purchasers. Reply from Staff: Thank you Julie. We appreciate you taking the time to leave your review. Have a wonderful day.